ESI-50: amazingly capable small business phone system | Telco Ltd. When choosing a phone system, small business owners have traditionally had to settle for less when it comes to features and capabilities. Things like ACD (Automatic Call Distribution, or “holding for the next available agent), PRI (digital dialtone) support, Service Observe (ability to monitor staff calls for quality assurance or training), and more have been out of reach of many small businesses, because manufacturers tend to develop these types of capabilities for larger (and more costly) systems. This is true no longer with the arrival of the ESI-50, a truly capable small business phone system. When ESI (our phone system manufacturer of choice) designed its newest line of Communications Server phone systems, it chose to use a common code base throughout its product line. This means that, in theory, the smallest Communications Server system (the ESI-50) can do most or all of the same things that even ESI’s largest system (the ESI-1000) can do; the primary difference is capacity. Like ESI’s other systems, the ESI-50 takes a converged approach, meaning that it can support both digital and IP phones with ease. And like other ESI phone systems, you’ll get a simple-to-use but powerful system that will make using the phones a breeze rather than a chore. ESI phone systems have been designed from the ground up to be user friendly (for example, by offering a built-in verbal HELP button on every phone), intuitive (no more scrolling through a series of menus or memorizing feature codes just to get something done), and tightly integrated–because the voicemail and phone system functions are handled through the same processor and use the same storage space, responsiveness is instantaneous and you can do some really great things (like view the Caller ID of each voicemail message and call them back by pressing one button, view a visual indicator of old and new messages, view a countdown timer so you can see how long each message is, etc). Another example: if I want to create a new voicemail message for several recipients on the fly, I can pick up my phone and press the VOICE MAIL button, followed by the direct station button for each of the users I want to receive my voicemail message. No hunting through menus. No dialing of extension numbers is required. This is one of many features that ESI is able to accomplish due to its patented, all-in-one design. There are many more things that the ESI-50 supports that small business owners will love, including full auto-attendant capability with up to 100 branches that can go several levels deep if needed; 16-party conferencing; a message Recycle bin that stores the last 10 deleted messages (for retrieval in case of accidental deletion); a Caller ID button for each phone that shows the most recently received calls and whether they were answered, went to voicemail, or were redirected or missed. 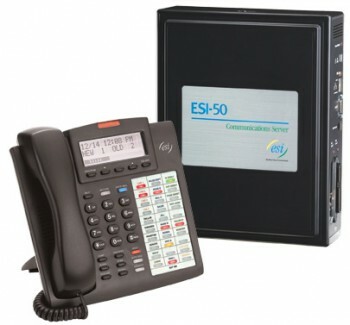 The ESI-50 also supports other ESI-exclusive products, including its award-winning VIP PC software for unified messaging, call control, station programming, and more; Presence Management (RFID capability that is tightly integrated with the phone system to provide door phones, security access, and time clock/time and attendance functions); and Cellular Management, which is ESI’s unique solution to taming your cell phone when you’re in the office. The ESI-50 additionally supports the latest in wireless handset technology, DECT 6.0. If you have multiple locations, you can even place an ESI-50 Communications Server or higher at each location and tie them together seamlessly via Voice Over IP, and they will act as if they’re one large system (alternatively, if you have sites that don’t require a full phone system, you can also place one or a few Remote IP phones at the remote location or locations). All the benefits of the ESI-50 are too numerous to list here (you can get a brochure on the ESI-50 here, or view some introduction videos on ESI phone systems), but suffice it to say that small businesses no longer need to settle for a stripped down version of a phone system, missing features that would benefit them. And the best part is, the ESI-50 is still in an active development cycle. In the next few months, even more capabilities and features will be announced that will further separate ESI from the pack and more firmly establish it as a leader in the industry. Stay tuned!